Effective policy mechanisms are crucial in limiting the impacts of invasive alien species in Europe. New regulations will help co-ordinate action across the European Union, with country level monitoring systems enabling rapid responses to introductions. Improvement of the regulations will include greater emphasis on prevention, which will be crucial in enabling the EU to meet its commitments to the Biodiversity Strategy 2020 Target 5 on invasive alien species and the Convention on Biological Diversity (CBD) Aichi Target 9. Five hundred alien species have demonstrated negative biodiversity impacts across the globe, with this number likely an underestimate (McGeoch et al. 2010). Over 30% of extant birds are currently threatened by invasive species (BirdLife International 2013) and half of the planet’s recent bird extinctions have been linked with non-natives (BirdLife International 2008). This is of concern since the number of invasive species in Europe has increased by 76% since 1970 (Butchart et al. 2010). There are now thought to be 12,000 alien species in Europe, with terrestrial plants, introduced through ornamental gardening, being the most common. Of these 12,000, roughly 10-15% have become invasive (Regulation (EU) No 1143/2014). Co-ordinated action across the whole of the European Union is therefore crucial in preventing new introductions and in enabling rapid responses. In January 2015, a new regulation came into play to enable this—the EU Regulation 1143/2014 on Invasive Alien Species. Under this regulation a priority list of concern species will be regularly updated and a scientific forum established to ensure listings are based on robust science and not political agendas. Derogations that were previously in place have been dropped, ensuring stricter regulation for invasives across the whole of the EU. The regulation states that within 18 months of its enforcement each member country should have set up their own centralised information system that collates information on invasive species distribution and ecology, and which enables effective detection, monitoring and management. Belgium has had such a system in place since 2012, whereby volunteers can report the sighting of invasive species with a photo and exact location. 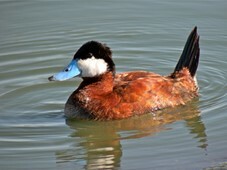 The system has already helped with an eradication programme for Ruddy Duck Oxyura jamaicensis and is also being used in controlling exotic goose species (BirdLife 2015). Whilst there are many benefits to the new regulation, there are limitations that could undermine its effectiveness. Risk management of introduction pathways is, for example, currently voluntary and the current list length of priority species doesn’t address prevention, with only 37 species being listed, excluding parakeets, Canada geese and species currently absent but that could be of high risk if introduced. A focus on introduction prevention will be important in enabling the EU to meet the EU Biodiversity strategy 2020 Target 5 on invasive alien species and the Convention on Biological Diversity (CBD) Aichi Target 9. BirdLife International (2008) Invasive alien species have been implicated in nearly half of recent bird extinctions. Presented as part of the BirdLife State of the world's birds website. Available at: http://www.birdlife.org/datazone/sowb/casestudy/127. BirdLife International (2013) Small island birds are most at risk from invasive alien species. Presented as part of the BirdLife State of the world’s birds website. Available at: http://www.birdlife.org/datazone/sowb/casestudy/128. BirdLife International (2015) Citizen scientists help track invasive species in Belgium. Presented as part of the BirdLife State of the world's birds website. Available at: http://www.birdlife.org/datazone/sowb/casestudy/696. Butchart, S. H. M., Walpole, M., Collen, B., van Strien, A., Scharlemann, J. P. W., 1 Almond, R. E. A., Baillie, J. E. M., Bomhard, B., Brown, C., Bruno, J., Carpenter, K. E., Carr, G. M., Chanson, J., Chenery, A. M., Csirke, J., Davidson, N. C., Dentener, F., Foster, M., Galli, A., Galloway, J. N., Genovesi, P., Gregory, R. D., Hockings, M., Kapos, V.,Lamarque, J-F., Leverington, F., Loh, J., McGeoch, M.A., McRae, L., Minasyan, A., Morcillo, M. H., Oldfield, T. E. E., Pauly, D., Quader, S., Revenga, C., Sauer, J. R., Skolnik, B., Spear, D., Stanwell-Smith, D., Stuart, S. N., Symes, A., Tierney, M., Tyrrell, T. D., Vié, J-C. and Watson, R. (2010) Global Biodiversity: Indicators of Recent Declines. Science 328: 1164–1168. McGeoch, M. A., Butchart, S. H. M., Spear, D., Marais, E., Kleynhans, E. J., Symes, A., Chanson, J. and Hoffmann, M. (2010) Global indicators of biological invasion: species numbers, biodiversity impact and policy responses. Diversity Distrib. 16: 95–108.